Sheikh Hassan Nasrallah, leader of Lebanon’s Islamic Resistance Hizbullah says the US president has proved that America is run by White and Zionist racists – but the Resistance is not afraid of idiot Donald Trump (listen below). Nasrallah, in a speech Sunday, thanked Trump for tearing off the hypocritical mask of previous administrations and revealing the true nature of Washington and its “racism” against the oppressed peoples of the world. “Trump has not come up with anything new. 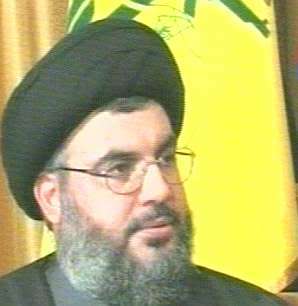 He just revealed the real face of the racist, oppressive and ugly US administration,” Nasrallah said. He went on to say that Trump’s predecessor Barack Obama was just the same except for the fact that he sugarcoated with nice words and speeches while carrying out drone strikes in several Muslim-majority countries and supporting oppressive regimes like Israel, Saudi Arabia and Bahrain. “We are very optimistic that when an idiot settles in the White House and boasts about his idiocy, this is the beginning of relief for the oppressed around the world,” Nasrallah said dismissing that his movement would be fearful of the new pro-Israel aggressive US administration. Trump is scheduled to receive Benjamin Netanyahu in the White House on Wednesday. According to Israeli media, Netanyahu plans to discuss with Trump everything except Israel-Palestine issue. According to Netanyahu interpretation, Trump administration has already given him green light to grab more Palestinian land in the West Bank and East Jerusalem for new illegal Jewish settlement. Netanyahu is expected to rant his usual Iranophobia because without making another Iraq out of Iran – the Jewish army cannot defeat Hizbullah. He would urge Trump to put more crippling sanctions on Iran, tear P5+1 nuclear agreement with Iran and boast that in the next war the Jewish army is going to destroy Hizbullah without American military help. Lebanese president Gen. Michael Aoun met Egyptian military dictator Gen. Abdel Fattah el-Sisi in Cairo on Monday. Aoun told his host that since Lebanon didn’t have a conventional army, Hizbullah’s armed wing is essential for defending the nation against its regional enemies and foreign terrorist groups. Aoun also visited Arab world’s oldest university Al-Azhar established by Shi’ite Fatimid rulers in 970 CE. They also built the Cairo city. This entry was posted in World News and tagged Hizbullah. Bookmark the permalink.